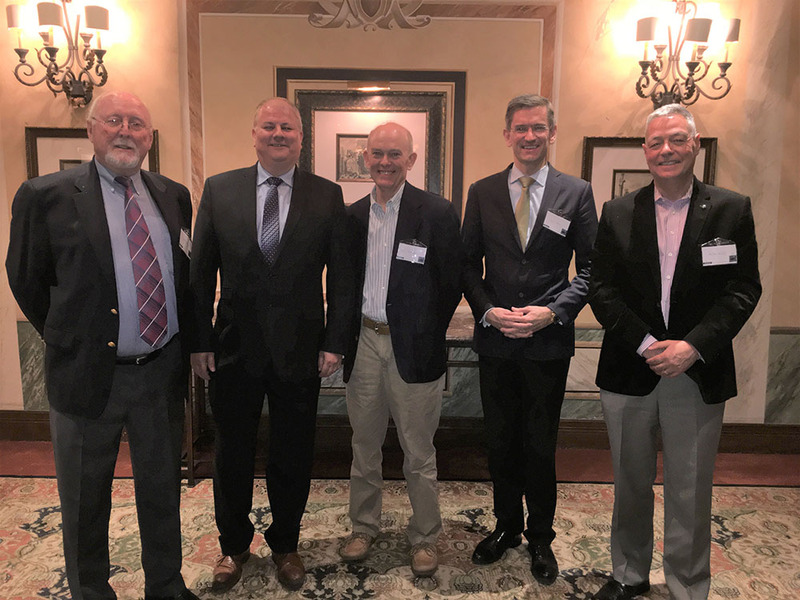 Dr. Paul Jukes recently attended a dinner attended by the Fellows of the US Gulf Branch of the IMarEST in Houston. The Dinner and Networking event was in the presence of IMarEST Chief Executive David Loosley and Communications Director Charlotte Lord. Mr. Loosley spoke at the event, and gave an update about the IMarEST, and the 5-year Strategic Plan. This was also an opportunity for HQ to meet local Fellows of the Branch. The current Chairman, Alan Mills, gave a few words of thank you to everyone who attended. “This event was a great Success, and thoroughly enjoyed by all who attended.” – Alan Mills FIMarEST, Chairman of US Gulf Coast Branch. This was also an opportunity for the previous Chairman’s of the US Gulf Coast Branch to get together for a group photo with David Loosley. Previous Chairman’s of The US Gulf Coast Branch included Peter Brock (1990 to 1998), Stan Symon (1998 – 2001)[deceased], Mark Waller (2001 – 2004), Ben Thurmond (2004-2006), Dr. Paul Jukes (2006 – 2012) and Alan Mills (2012 – present). The US Gulf Coast Branch was started in 1990 by Peter Brock and Mark Waller. This Fellows Dinner was the first time for the past and present Chairman’s to meet, and be together, at the same time. The JukesGroup honors your privacy and does not sell, rent or loan any identifiable information collected on this site. Any information that you give through various forms like ‘Contact Us’ or e-mails us based on the information on the website is treated in a careful and confidential manner. It will not be used in any way other than for the reason that we disclose while collecting the information. The contents of these web pages are copyright � TheJukesGroup 2015. You can download information from the website for your personal use. You may also use downloaded content provided you do not do so for profit. Bill has more than 30 years of industry experience in research and project engineering roles. His expertise includes engineering mechanics, geomechanics, structural engineering and Abaqus. Bill has authored more than 30 publications. Bill is affiliated to The Jukes Group through his own Company – ASGM (Applied Structural Mechanics, Applied GeoMechanics). 18 years of experience in Oil and Gas. Encompassing onshore & offshore pipelines, tubulars, reservoir, drilling and production and oilfield equipment. Published extensive industry/conference papers on onshore & offshore pipeline engineering. Over 15 years of extensive engineering and management experience working in the O&G sector, working in the US, UK and SE SEA. Has successfully managed upstream projects involving installation engineering, onshore & offshore pipelines, riser system design, marine systems engineering, advanced FEA and pipeline engineering. Technical Authority in Hydraulics, Flow Assurance (FA) and Multiphase Flow, with 25+ years of engineering experience in the Oil & Gas Industry. Strong team leadership and project management skills. Leading expert with hands-on experiences in steady-state and transient hydraulic simulations, hydrate/wax/scale/corrosion control strategies, and flow assurance operability. Extensive expertise and experiences in fluid mechanics and heat transfer. Excellent skills in designing experiments and developing simulation models to solve challenging problems. Previously worked for major clients, such as ExxonMobil and Shel E&P. A proficient user of Synergi Pipeline Simulator (SPS), OLGA, PIPESIM, PVTSIM, Multiflash, Impulse, and HYSYS. Dr. Soni has MS and Ph.D degrees in Engineering Mechanics from the University of Texas at Austin. He has about 35 years of experience in theoretical and computational modeling; 10 years in university research and aerospace, and over 25 years in the Oil & Gas industry. His areas of expertise include nonlinear structure, structural dynamics, vibrations, and fatigue and failure analysis of built-up systems such as Wellbore Completion and Intervention assemblies. He developed stress and fatigue analysis methods to support the design of whipstock casing window exit BHA’s for high-deviation (ultra- short radius) wellbores for Baker Hughes. His analytical and experimental studies on liquefaction were key to the development of a downhole resonance tool for the extraction of sand stuck tubulars; and debris-laden flow CFD analysis to the development of a very efficient downhole sand, rock, and metal cuttings removal tool. His interests also include nondestructive testing. He was instrumental in the ISO certification of BHI’s chemical and gas injection side pocket mandrels using strain gage tests and FEA. He developed standardized modeling and simulation procedures to guide design engineers and non-expert analysts and had technical supervision of the performance of Baker Hughes’s wellbore completion and artificial lift FEA and CFD projects outsourced to overseas contract analysts. He is proficient in the use of industry leading analysis software including ABAQUS, ANSYS, MARC, DYTRAN, FLUENT, and Star-CCM. He has eight US patents and over 50 technical publications to his credit. More than 20 years of work experience in Subsea Engineering, Subsea hardware, Subsea Pipeline Engineering, Subsea Structures and Deepwater Drilling. SPA of Joint Industry Project (JIP) on Sealing and Structural Performance of API 7 1/16” 15K Flange (BP). Developed business case for the proposed API 18 ¾” 15K Flange JIP. Engaged various vendors, selected vendor, championed and launched the API 7-1/16” 15K Flange JIP as a preparatory phase for the API 18 ¾” Flange JIP. The 7-1/16” Flange JIP has enabled a cost savings of $1.5M towards the proposed 18 ¾” Flange JIP (BP). Responsible for establishing and growing the R&D Group. In the process of developing various collaborative initiatives with industry, regulatory bodies and the academia. Developing branding for R&D group of The Jukes Group as a premier research entity. Guiding young engineers to achieve excellence in engineering and research. Over 30 years of experience with subsea pipelines and risers data analysis. Worked extensively as Project Engineer dealing from Pre-FEED to EPCI stage of Subsea field development with expertise in Risers and Pipelines. Sound working knowledge of key E&P technical, economic and commercial issues in asset management. Worked on deriving parameters of riser vibration response from recorded data. Provided critical QA/QC oversight of design and project documentations. Dr. Mirza is also currently lecturing courses on reliability of subsea systems at Texas A&M University. Over twenty two years of worldwide experience in multiphase flow research, subsea, deep-water flow assurance and operability, including nearly 5 years with a major international oil/research company and exposure to a variety of offshore and onshore projects throughout his career. Krishnathasan provides technical service support for flow assurance issues, in particular, a wide range of multiphase flow analyses and operating strategies. He has been involved in projects ranging from early conceptual studies to detail design engineering, as well as the development of operating guidelines for successful field operation. He holds a M.Sc. in Mechanical Engineering from the Norwegian University of Science and Technology. Software proficient in OLGA, PIPESim, PVTSim/Multiflash, MAXMUS, HYSIS and NATASHA. Experienced in research, technology development, training and educating engineers/ production operators. Jai Dhodhi, a Chem. Engineer with over thirty years’ experience in executing offshore projects which include both fixed and floating facilities. He has managed all aspects for project execution i.e. Feasibility studies, Pre-FEED, FEED, FEED Verification, Detailed design, Procurement services and Follow-on support during construction and commissioning. He specializes in execution of FPSO’s and had led the FEED Verification and Detailed design of CVX Agbami FPSO, the largest producing FPSO in the world. His main focus is safety, cost and schedule which are the main drivers of a successful project execution. Dr. Qiu has more than thirty years of work experience in civil structure, offshore structure design and stress analysis, SCR analysis and umbilical analysis. He has designed PLEMs, Sleds etc. for many field development projects. Dr. Qiu was involved the SCR extreme, fatigue, VIV and clashing analysis, flexible pipe and platform topside jumper analysis, umbilical capability, fatigue and clashing analysis. Dr. Qiu’s pipeline experience included the designing and field installation throughout his career. Dr. Qiu was also involved in some special projects, for example, BP MC252 drilling riser recovering analysis. Dr Qiu has a Ph.D. in Applied Mechanics and has a patent and published paper at International Conferences. Dr. Edward Clukey has over thirty years experience offshore geotechnical engineering for the oil and gas reserves. Previous roles included Geotechnical Advisor at BP America (1998-2015), U. S. Geological Survey in California (1976-78), and Exxon Production Research (13 years). Developed suction caisson technology for deepwater applications, and installation of over 100 suction caissons throughout the world for BP. A world leading expert in centrifuge testing and advanced numerical models. Dr. Clukey Chairs an API task group (API RP2 GEO) and is the author of 50 technical publications and is a registered professional engineer in California, a member of the Society of Underwater Technology and a Diplomate in ASCE for both Geotechnical and Ocean Engineering. Dr. Ghoneim has B.Sc. degree in Civil Engineering from Cairo University and M.Sc. and Ph.D. degrees from the University of Calgary. He worked as a consulting engineer in Calgary for three years. He joined Dome Petroleum/CANMAR as supervisor of ship design team (five years). His responsibilities included design and operational support for Dome’s Arctic fleet of drilling vessels and platforms. Dr. Ghoneim worked for DNV in Calgary (three years) and then Houston (24 years) where he managed offshore classification, certification and research activities and was involved in developing parts of DNV MOU Rules and Offshore Standards. He participated in the teaching of DNV courses on probabilistic analysis, buckling, fatigue, and Arctic Technology. He also worked as PM on classification and construction surveillance of Jack-up and Semisubmersible vessels. He also performed verification, PE certification, and FEM of a number of FPS units. Dr. Ghoneim has been actively involved in several API, ISO, IADC, and SNAME committees throughout his 40 year career. He is a member of SNAME and MTS, and a life member of ASCE. He worked for Atkins Oil & Gas in Houston for three years and was the Engineering Manager responsible for technology development, profiling and Advanced Analysis. He has also managed a number of projects dealing with fire and blast design and collision/impact investigation. He is currently President of Frontier Professional Engineering & Design LLC a consulting company acting as independent contractor for The JUKES Group in the role of VP, Engineering and Marine Technology starting April 7, 2016. Dr Valenzuela has over 29 years of experience as a riser, flowline, and pipeline consultant with extensive global analysis experience on floating production installations (FPIs); he is an expert on performance based design (fatigue and structural strength) for all types of riser configurations, including drilling, production, dynamic umbilical systems, and composite risers applied to deep and ultra-deep water projects. He has provided expertise in the design and installation of pipelines and subsea offshore systems to major companies in the oil & gas industry. He earned a Bachelor and a Master’s Degree in Civil Engineering, and a Ph.D in Structural Engineering from the University of Texas, Austin. He also has an MBA and is a Chartered Engineer and a Fellow of The Institute of Marine Engineering, Science & Technology. He is a registered professional engineer in Texas; and a member of the American Society of Mechanical Engineers (ASME), and a member of the American Society of Civil Engineers (ASCE). He is the author of 24 technical publications, and he was granted a U.S. Patent on the method of installation of a light-weight jacket structure; which was also registered and recognized in Canada. Dr. Paul Stanton was Vice President of Riser Engineering at Technip from 2000 to 2010. He was a Senior Advisor in the Riser Department at Genesis from 2010 to 2015. Paul has a Ph.D. from the University of Oklahoma and joined Exxon Production Research in 1968. He has over forty years of experience in deepwater floating drilling research and engineering, subsea production research, TLP and Spar well systems research and development, and riser engineering management. He has been active in development of API standards for subsea wellheads and riser systems for most of his career. Dr. Stanton was chairman of the task group that revised API standards for dynamic riser systems. He was elected to the Offshore Energy Center’s Hall of Fame in 2014. Dr. Paul Jukes has over twenty years experience in the structural analysis and design of structures, pipelines, risers and subsea components. He has a Bachelors Degree in Mechanical Engineering and Structural Mechanics, and a Ph.D in Structural Engineering from the University of Sussex. He has an MBA and is a Chartered Engineer and a Fellow of The Institute of Marine Engineering, Science & Technology, a Fellow of The Institution of Mechanical Engineers, a Fellow of The Energy Institute, and a Fellow of the Chartered Management Institute. Dr. Jukes has published over 130 journal and conference papers. Previously the Group Managing Director of MCS Kenny, a Wood Group company. Over 40 years’ experience, and is a world leader, in offshore construction, assessment of constructability of subsea pipelines and structures within the oil and gas industry. Proficient with field supervision and project management functions to assure attainment of specified timelines. Highly effective with cost control, preparation of RFQ packages, and evaluation of bids and procedures. Principal objectives are to plan, direct, and execute work in a manner which fully meets the client’s expectations. Strengths include client interactions, management of change, and problem resolution.